. Mr. Allison was predeceased by his wife of 48 years, Betty Parker Allison; a brother, Jim Allison; and his stepmother, Rachel Oglesby Allison. He attended the Virginia Military Institute and left to become a U.S. Army paratrooper during World War II. Mr. Allison received his undergraduate and graduate degrees from Virginia Tech. He worked for Smith Douglas Fertilizer, then for Virginia Tech as an extension agronomist at the Tidewater Research Station in Holland [VA], with a specialty in peanuts until his retirement in 1988. He was a member of Holland United Church of Christ. Survivors include two sons, James Parker Allison of Washington, D.C., Allen Hickman Allison Jr. of Encinitas, Calif.; two sisters-in-law, Nancy P. Richardson of Virginia Beach and Margaret Allison of Roanoke; brother-in-law, Owen Parker and his wife Kathy of Mount Olive, N.C.; first cousin, Catherine Gannaway of Pulaski; numerous nieces, nephews, grandnieces, grandnephews; and a special friend, Louise Haynes of Pulaski. A graveside service will be conducted at 11 a.m. Tuesday in Holland Cemetery. The family will receive friends at The Village at Woods Edge, 1401 North High St., after the service and suggests memorials be made to the American Cancer Society, c/o Kathy Worrell, 717 Fairview Drive, Franklin, VA 23851. 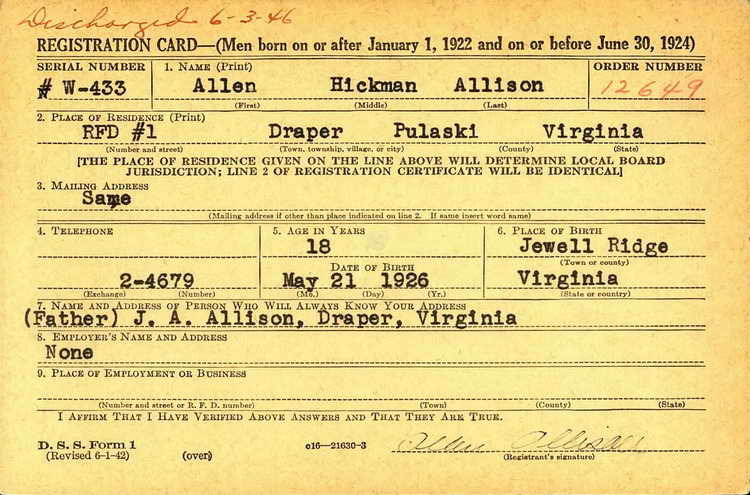 Allen H. Allison registered for the draft ca. 1944. He began service in the Army on 5 June 1944. On 16 October 1945, Sgt Allison was transferred from the 101st Airborne Division to Headquarters 2nd, 508th PIR. Sgt Allison was discharged on 3 June 1946. 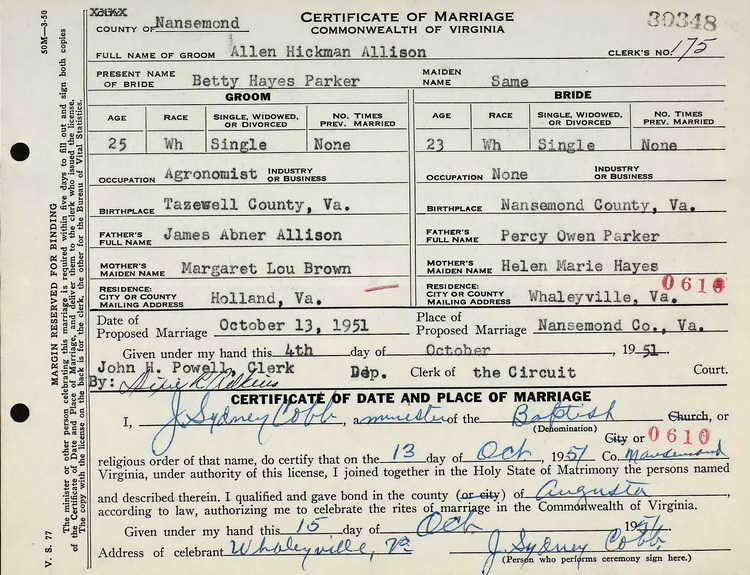 Allen married Betty Hayes Parker [1927-1999] in Nansemond County, Virginia on 13 October 1957. 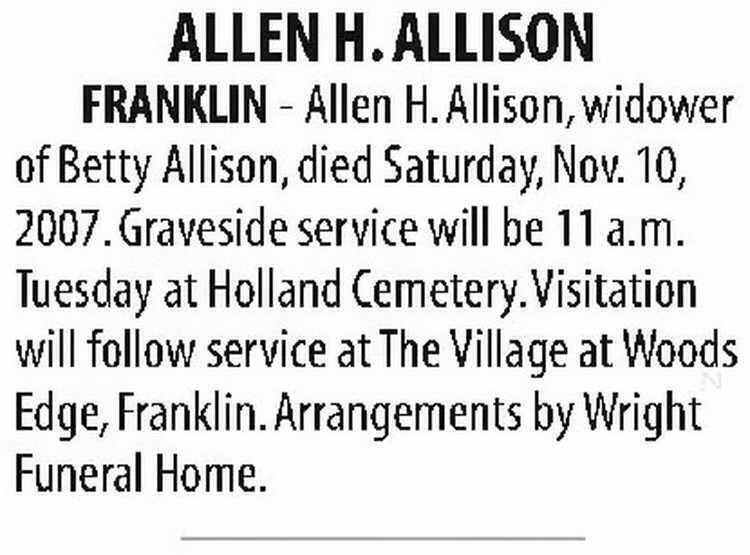 FRANKLIN - Allen H. Allison, widower of Betty Allison, died Saturday,Nov.10, 2007.Graveside service will be 11 a.m. Tuesday at Holland Cemetery. Visitation will follow service at The Village at Woods Edge, Franklin. Arrangements by Wright Funeral Home.